After four days in Stockholm, it’s time to head to Tallinn on an overnight ferry. I load my travel backpack and walk to the metro station to head to the ferry terminal. I board a very crowded train, grab hold of a strap, and try to keep my balance as the train hitches and jerks under the streets of the Gamla Stan. This one guy on the train keeps jostling me, as if he is trying to reach for a distant strap or make his way through the crowd. But there’s no where for him to go. My backpack is heavy. The walk was long, and I am fatigued, both mentally and physically, after almost two weeks of travel. This guy is annoying. He keeps bumping me, and I am just trying to hang onto the strap so I don’t fall. Finally we reach the stop where I have to change to another train. I get off, and as I try to get my bearings to figure out where the next train will arrive, I put my hand in my pocket where my wallet is. Pickpockets can strike anywhere, but they are most effective in places where there are a lot of people and a lot of activity to distract us. Places like crowded metro stations and trains, busy tourist attractions, and areas where street performers have gathered a big audience are favorite spots for pickpockets to lurk. And as alert and savvy as we think we are, we can’t keep our guard up 100% of the time. Even Rick Steves has had his wallet stolen. Fortunately, I had a money belt. At the time, I wasn’t wearing it, but rather was carrying it in my backpack. Unfortunately, in my hurry to make my way to the ferry, I had neglected to transfer my credit cards and driver’s license into my money belt. I had $200 cash and my passport (thank goodness!) and nothing else. Money belts come in many different varieties. Like the one pictured above, a common design has an elastic waistband. You wear it under your clothes. Another option is the neck wallet, which hangs under your clothes from a strap around your neck. You can also find actual belts that have zipper compartments on the inside, but you won’t fit much into these other than some cash. My thinking is that this is a no‐brainer. Keeping your valuables secure under your clothing where they are inaccessible to pickpockets is a smart idea. 1. Locals don’t use them, so we shouldn’t either. There are a several reasons locals don’t use money belts. First, they don’t especially look like tourists. They aren’t stopping to take photos or following a map or guidebook. They might not be carrying a lot of money, credit cards, or a passport. And if they are a victim of a pickpocket, they can go home. They have friends and family who can help them recover. While being pickpocketed in your home city is inconvenient beyond question, it will not force you to disrupt a trip you’ve spent many months and many dollars planning. 2. You don’t use it at home, so why should you use it when you’re traveling? This is pretty much the same argument as #1, and the response is pretty much the same. The risk may be lower if you are not distracted by your sightseeing and are not hanging out in places that are frequented by tourists (and by pickpockets). And the consequences are probably lower as well. On the other hand, when I lived in the suburbs of New York and was traveling into the city, I always stuffed some cash into my socks, so if I was pickpocketed, I wouldn’t be stranded. Sometimes, even at home, it makes sense to take precautions. 3. The likelihood of being pickpocketed is so remote, there’s just no need to wear a money belt. People who make this argument will often go on to say that they’ve traveled all over the world, never worn a money belt, and never had their pocket picked. QED. This is an example of hasty generalization. First of all, it may or may not be true that getting pickpocketed is rare. Second, just because it hasn’t happened to me, it doesn’t follow that it’s unlikely to happen to anyone. And even if it is rare (which is is not, though statistics are very hard to come by, since many non‐violent thefts go unreported), if wearing a money belt reduces the risk, is it really such a bad idea? We buy insurance to protect against unlikely risks. We wear seat belts. We take many precautions against unlikely calamities. 4. All the thieves and muggers know about these and will find them, so they don’t actually protect you. Isn’t that kind of like saying that locking your car door won’t actually protect you because the thieves can just break the window? It’s probably true that a money belt won’t protect you from a violent attack. But it’s not meant to. It’s meant to protect you from having your pocket picked. 5. Money belts are uncomfortable. 6. Money belts are conspicuous. If you open your clothes in public to access what’s in your money belt, yes, they are going to be conspicuous. Or if you load them with bulky items that cause them to create bulges. But that’s not how you should use your money belt. Keep reading, and I’ll get to that below. 7. Money belts look ridiculous. Only if they are conspicuous. See #6 above. 8. Using a money belt encourages carelessness. If you think putting your valuables in a pouch hidden under your clothing makes you immune to theft, you are wrong. You’re just making the pickpocket’s job more difficult. Don’t become casual about security in general just because you’re wearing a money belt. But to suggest that the money belt will cause you to be cavalier is just silly. It’s just too easy to let your guard down or to be distracted or confused or scammed by clever techniques to part you and your valuables. This is true whether or not you are hiding things where they are largely inaccessible to thieves. 9. It is a proclamation that you are suspicious of everyone, which is at best insensitive, at worst steeped in bigotry. I have to say I don’t understand this one at all. If I walk around with my money hidden under my clothes, how does this indicate any particular attitude about anyone? In fact, wouldn’t it be worse if you carried a cross‐body bag and huddled it in front of you? Doesn’t that convey more mistrust? And let’s be clear about one thing: there are no age, gender, or ethnic markers that make pickpockets identifiable. Precaution is just sensible. 10. It’s better to divide your valuables in multiple safe places on your person and in your luggage, so if you lose one, you won’t lose it all. No one strategy will keep your valuables safe while traveling. Don’t rely solely on a money belt, or on any other tool or technique or philosophy. But when you consider the consequences of having your trip disrupted by a pickpocket, there’s little doubt in my mind that having valuables out of sight and out of reach by probing hands is a good thing. My opinion is that a money belt can be one part of a coordinated strategy that includes constant vigilance, avoiding distractions, leaving valuables in the hotel safe, carrying a purse or day bag across your body in front, and being discreet about what pockets you have money or credit/debit cards stashed. 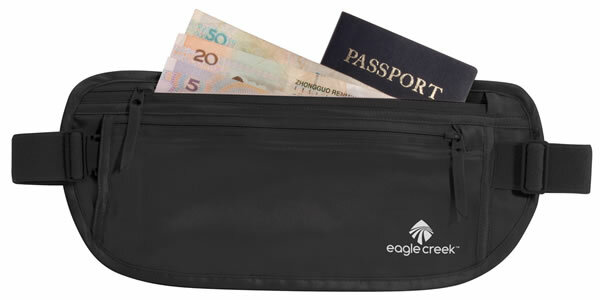 A money belt is not an essential part of your travel gear, though you may wish to use one if you think it will make you feel more secure. The most important rule about using a money belt is that you should never ever access it in public. If you need to get something out of your money belt while you’re out and about, duck into the nearest WC. The worst thing you can do is fumble around inside your clothes trying to get your passport or a debit card out of your money belt. Carry what you are using that day in your pocket: some cash, maybe a credit card, maybe a debit card. There are ways to secure these as well: pockets with zippers and snaps. Safety pins and strings. Rubber bands. All of these might work, though they all work best in conjunction with constant vigilance. I generally recommend keeping extra cash, backup credit and debit cards, and even my passport in the safe in my lodging, if there is one. Even if there isn’t, I think it’s generally smarter to hide valuables in a compartment in my luggage in my room while I’m out for the day. But on the days when I’m transferring between destinations, I have all my valuables with me, so I need to figure out the best way to keep everything safe. I put some stuff in a deep corner of my luggage, maybe in a sock in the dirty laundry compartment, or in a hidden zippered area. I carry the stuff I know I’ll need in a zippered pants pocket, making sure no one pocket has enough in it to produce a visible bulge. On these days, I either wear my money belt or stow it away in my luggage. Whether or not you decide to use a money belt or neck wallet, be alert. Don’t allow thieves to spoil your vacation. And don’t allow worrying about thieves to spoil your vacation either. Chances are you will not be a victim of theft. So go see the world, and have a great time! So you just called and stopped your credit cards and didn’t lose any money? I haven’t heard the term “hasty generalization” in years! I loved studying material logic! Your 10 point rebuttal was excellent! Sheila, I quickly called to cancel the credit and debit card. They reported that the thief had attempted and failed to make a withdrawal. So I lost no money (except the little cash I had in my wallet). Then I spent half the night on the ferry from Stockholm to Tallinn on the phone with the bank arranging to get an emergency card sent to my next destination. I was only able to get a replacement credit card, not a debit card. The biggest disruption was that I had planned to spend three days in Iceland driving around, and I had to cancel that because I couldn’t rent a car without my license. In the end, the alternate plans I made (to take day tours) were so enjoyable it might have been a blessing in disguise.